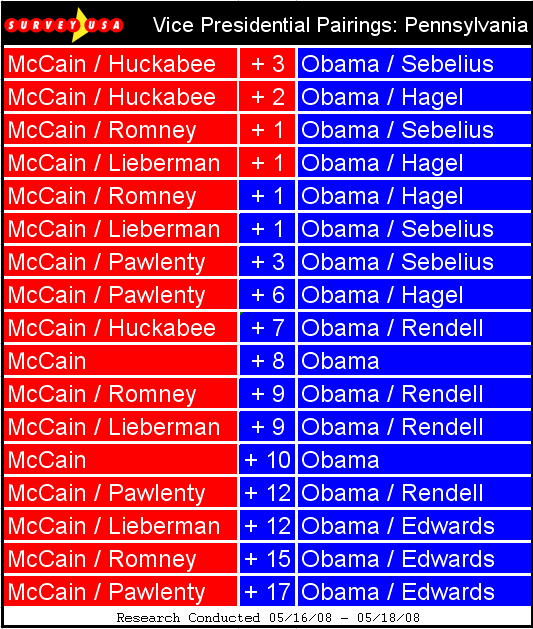 A barrage of polls recently released by SurveyUSA depict John Edwards as the best Vice Presidential choice when paired with other theoretical pairings for both Obama and McCain. 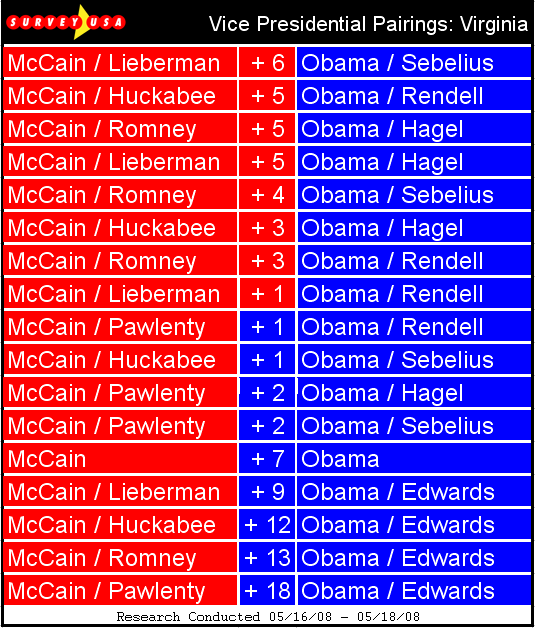 In the four states that were surveyed (Ohio, Virginia, California, Pennsylvania) the Obama-Edwards ticket shows the greatest amount of support winning by a minimum of 9 points across all VP combinations surveyed. Outside of the raw numbers I found it curious that a similar poll was not conducted with Hillary in mind, or for that matter that Hillary was not even included as a possible combination with Obama. SurveyUSA apparently determined that Clinton is too far beyond the realm of feasibly winning the nomination to warrant the investment. I also found it interesting that Chuck Hagel (Republican Senator, Nebraska) was included as a potential running mate with Obama. 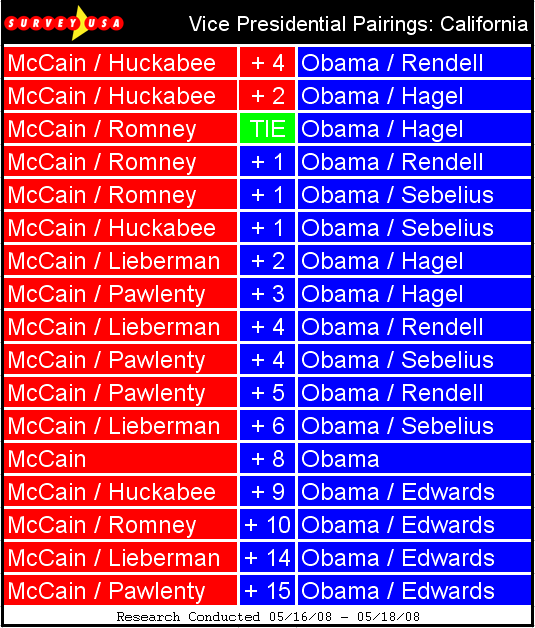 While Hagel is clearly the poorest performing VP choice on the Democratic front, his Republican association only appears to damage the ticket by few points. As a side note these are not states a Hagel selection would likely target. On the Republican side Tim Pawlenty (Republican Governor, Minnesota) is the worst choice as he doesn't win any of the theoretical matchups. Like Hagel however, the Pawlenty selection would focus more on the Midwest with a concentration on possibly stealing Minnesota from the Dems, and potentially swaying neighboring Iowa and Wisconsin while solidifying the Dakotas. Now that Obama has the deal sealed, the media has started to focus more time on his potential Vice President (VP but not Veep, because that's the stupidest abbreviation ever). The talking heads keep throwing out this idea of a joint ticket with Hillary; but then somebody from the panel gets wise and says "Well gee, Hillary doesn't really have anything to offer except her blue collar support," which then leaves the topic in limbo. After John's endorsement yesterday he becomes the obvious choice, but nobody wants to acknowledge the elephant in the room. He carried the largest percentage of blue collar support while he was still in the race and would add a key element, as would Hillary in the drive to win states like Pennsylvania, Ohio and Michigan. The superlative point however is that John Edwards could also give a significant boost to Obama in the crucial swing state of North Carolina, and to a lesser degree South Carolina, while Clinton's home state of New York remains a non-factor. Not only does Edwards offer a key demographic, a pivotal swing state, but he is also the cliche white male. That third fact is irrelevant to states like Minnesota and Washington, but in the bible belt it may very well be the key to winning, or at least forcing McCain to spend in states like West Virginia and Kentucky where the population has clearly demonstrated they don't feel comfortable voting for a black man. Edwards appears to remedy these problems. What more could you ask for? Edwards has a loyal group of supporters, experience running a high stakes campaign, a sound fundraising base and a crucial demographic. The only downside lies in his general lack of military and foreign policy experience. However this minor blemish could be overshadowed by preemptively agreeing to name Jim Webb (Senator Virginia) as the Secretary of Defense, and Joe Biden (Senator Delaware) as the Secretary of State; the two most knowledgeable Democrats in the country on the respective issues, thus effectively erasing Edwards' negatives. John Edwards completes the ticket, he offers a complementary view of the issues that aligns with Obama's message while at the same time targeting key demographics Obama has not yet been able to reach. After recieving 7% of the vote in West Virginia John Edwards has decided to endorse Barack Obama at a Michigan campaign stop within the hour. The endorsement will likely shift Edwards' 18 delegates to Obama placing him 116 delegates short, based on our figures, of the magical 2025 needed to secure the Democratic Nomination. 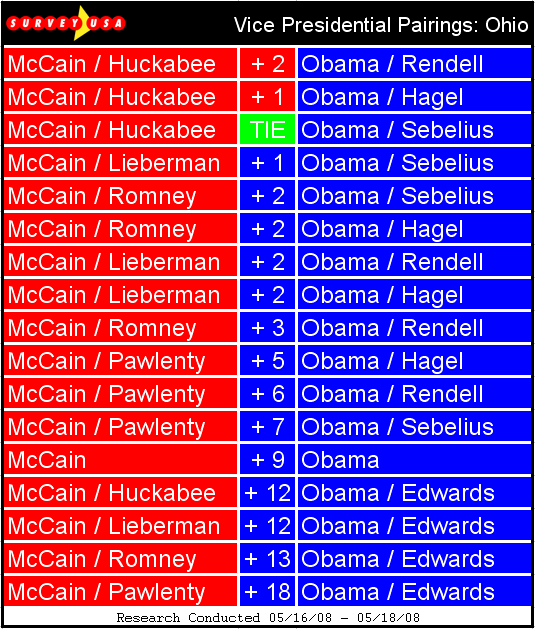 I was collecting data from West Virginia and noticed that John Edwards received roughly 7% of the vote. This is simply just not okay. In response I'm calling out anybody, any of the 26,181 citizens of West Virginia who committed an hour of their day to vote for John Edwards. In criticizing I want to be crystal clear and overtly state that there was nothing wrong with voting for Edwards when he was actively competing, but after suspending his campaign over three months ago there is no way to justify this vote. In response I ask one simple question: what was your reasoning behind this vote? I genuinely want to know, was it a protest, something completely different, or simply irrationality. Irregardless of your reasoning your collective inability to choose amongst two candidates, both of which assimilated the ideas of John Edwards, the candidate for whom you ultimately voted, effectively thrust your state further into irrelevance. This irrelevance permeates beyond perhaps the most transcendental Democratic Candidate in the history of this nation and verifies his decision to completely ignore West Virginia. Despite what all the pundits may say West Virginia will be a non-factor in the nomination process and will not, I repeat will not catapult Hillary to the nomination. At this point it would be a logical move for Obama and the Democrats to entirely ignore West Virginia and its 5 Electoral Votes for the General Election in much the same way they ignored it for the primary. Jay Rockefeller, a Democratic Senator from West Virginia, up for reelection will retain his position regardless of national politics and the two Democratic House members can easily fend for themselves because the GOP has no money to contest their seats and the three special elections in Illinois, Mississippi and Louisiana depict a clear change in public sentiment that favor the Democratic side. On top of it all West Virginia has routinely voted for the national victor, but there Electoral Votes have consistently proven to be irrelevant. Instead of trying to force relevance upon a state that has historically been irrelevant why not internally concede. The recent primary showed that even democratic loyalists have an inability to submit a quality vote so why seek to persuade the entire state when your own party cannot make a rational decision. Instead move on to more important states.